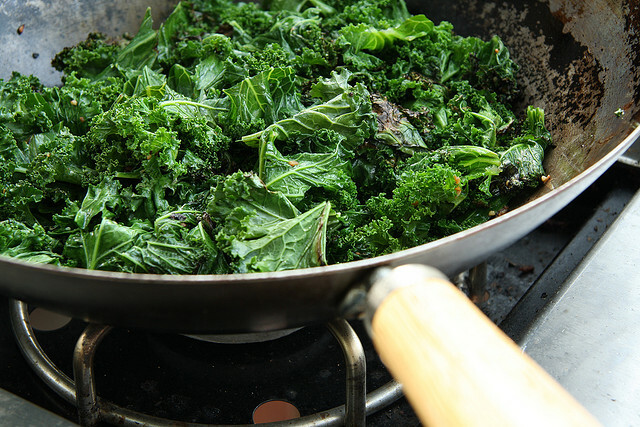 I never cooked with kale a lot or eaten it in a lot of different ways besides kale and potato mash or kale soup. As kale season has started I figured it was finally time to expand my kale experience so kale was on the menu twice this week. Basically because I had so much I had to cook with it twice but it gave me a chance to play around with it a bit. I know now that when sautéing kale, I should make the leaves a bit smaller than I did (and they were pretty small already!) and maybe cook them for 2 minutes or something like that before. That way hopefully the sauteing will take a bit less time and it will fit better in my pan; also I’m hoping it will make the chewing experience a bit less tiring. Another thing I learned the second time around, salt and pepper! The first day I didn’t use enough of it so the kale was rather tasteless but the second time around I put the salt and pepper in the pan before I put the kale in and it actually tasted like kale that time. Last thing I learned is that kale chips are kinda overrated, or I maybe put too much salt on mine, not sure. Maybe I should experiment with some other spices next time. And less salt. I made savoy cabbage chips earlier this year and I definitely liked those better than the kale chips, except for the batch that I burned because I put the temp of the oven up too high. Anyway, on to what I cooked this week! For the first day I felt like having cous cous so I searched for some recipe ideas and came across two that I liked, roasted Chickpeas with kale and cous cous from Grit & Grapes and couscous with kale and green garlic dressing from Naturally Ella.I combined both recipes because I couldn’t decide, both looked kinda good and I like giving my own spin on things, either because I don’t have all the ingredients or because I don’t like something a recipe requires or like in this case I didn’t know which one to make. I ended up making cous cous with kale, chickpeas, feta and garlic dressing. It was quite good except that when I make it again I need to tend to the kale a bit differently so it will have more flavor. Cook the cous cous and in the meantime sauté your onion and garlic. Add some salt, pepper and chili flakes before you add the kale in the pan (you can cook it a bit beforehand or throw it in and sauté it like that, which is what I did but next time I’m trying with cooking beforehand). Once the kale is almost done, throw in the chickpeas (obviously you can roast them before like the original recipe does but I was too lazy and hungry for that). While all of that is doing their thing in your pan, you can make the dressing. Mash some garlic and mix that with the oil, vinegar and honey. Add the feta to the onion, garlic, kale and chickpeas and let it melt a bit. Once everything is done serve with the cous cous and drizzle the dressing over your dish. The next day I figured I wanted to try kale with pasta and I had some tomatoes in the fridge as well so I looked around and found a recipe that was basically what I was going to do anyway, except for the almonds but that gave me the idea of adding some pine nuts. I can see chickpeas work well with this dish as well but I opted out because I used those the night before already. Cook your pasta and in the meantime sauté the garlic and onion in some olive oil, add salt, pepper and chili flakes before adding the kale to the mix and sauté some more. Roast the pine nuts in another pan while all of that is cooking in the other one. At the end add the feta, the tomatoes and pine nuts. Toss with your pasta and serve. I found the pasta dish a bit dry so I think I’ll be adding a can of diced tomatoes next time to make it just a bit more juicer, tomato sauce might also work but I think that might become a bit too overwhelming. My next kale adventure will be curry with kale! Probably with some onion and chickpeas to make it less kale only. Maybe I’ll add some potatoes as well. But that will be sometime next week I think. I should try! Thanks for sharing, looks yummy! 30 Something. Feminist. PhDer. Reader. Teacher. Animal Lover. TV Watcher. Researcher. ISFP. Vegetarian.